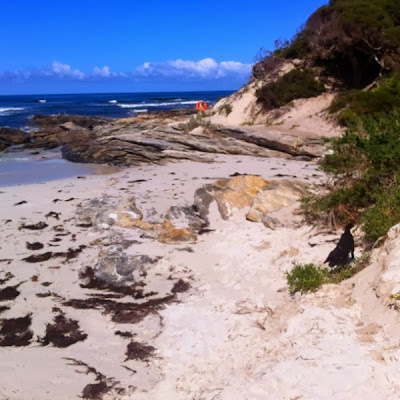 Travelling south to the coast I saw a town called Hopetoun and just had to go there because when we arrived in Australia back in the 1950's our first home was in the town of Hopetoun … not this one but in Victoria's north east. Interestingly both Hopetouns are in Mallee country. 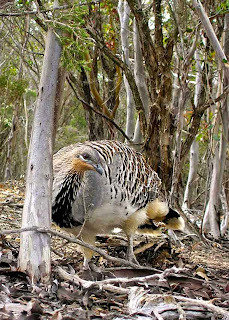 On the way down I called into the Yongergnow Malleefowl Centre which had some interesting information on the birds and district and there are two large fenced areas one with a male and female and the second with a lone female (her partner died a couple of weeks ago). 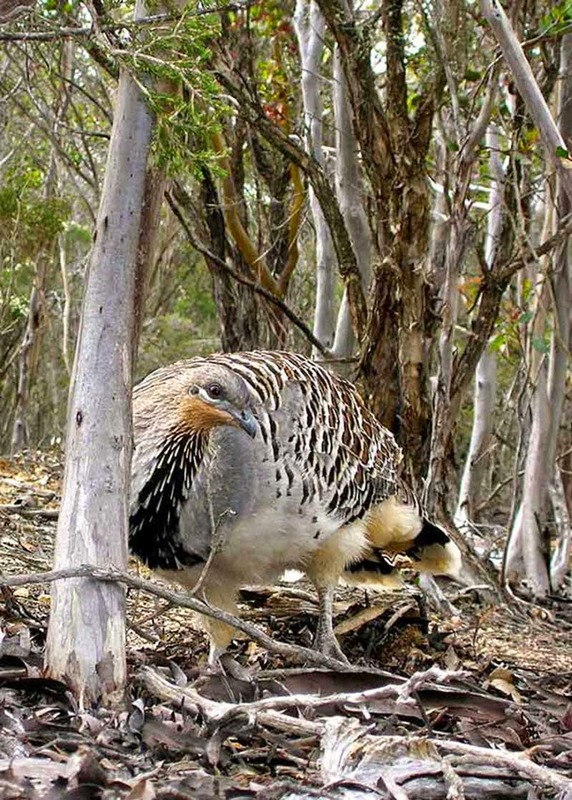 Malleefowl are a bit like bush turkeys in that they build a mound nest from dirt and leaf litter. They keep the nest at a steady 32-34ºC by adding and removing sand and using their tongue to monitor the temperature. When the chicks hatch after 60-90 days they are completely independent — no parenting required! Hopetoun was such a friendly town, on the the beautifully clear Southern Ocean, that I decided to stay there for a few days. Another incentive to stay was the Shipwrecked Gourmet Bakery. 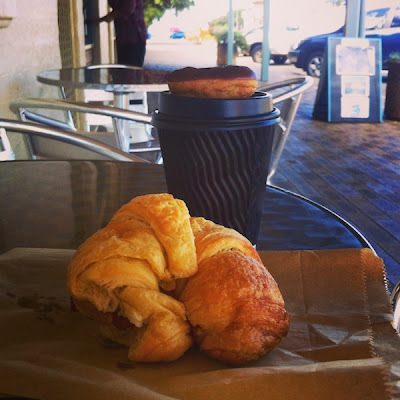 Levi and I enjoyed a 20 minute walk into town each morning and our reward of an excellent, buttery, ham and cheese croissant with a large cafe latte, the latter served with a tiny, tiny Éclair. These were enjoyed in the morning sunshine on the sidewalk where we met quite a few locals also enjoying these pastries. One man had actually managed Cobungra Station which is just to the north of where I used to live in the Victorian High Country. 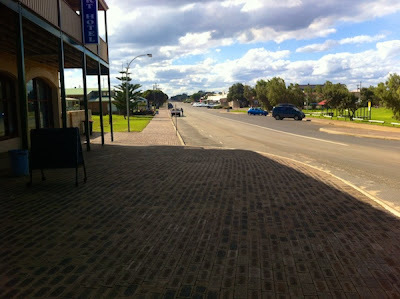 Hopetoun main street in the morning rush hour! I imagine it gets pretty busy here in summer though. There are actually 3 cafes in town as well as the hotel which has a restaurant, a couple of gift type shops as well as real estate agents (2), an IGA supermarket, hairdresser and police station. Most of the town's electricity is generated by wind turbines, they certainly get plenty of wind down on this wild south coast. Nickel mining is carried on here as well originally by BHP who sold to FQM Australia Minerals in 2008, but I wasn't really aware of it. It probably accounts for the general feeling of contentment in the town as around 450 people are employed by them in the area. 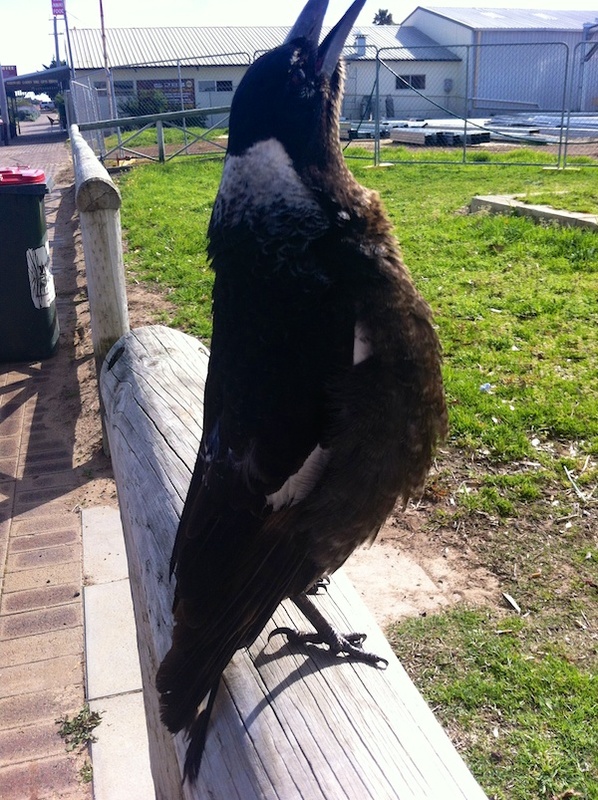 The other "tourist attraction" in town is Mickey the magpie who was hand reared by some locals and spends his day at various spots around town, one popular spot is on the door to the IGA or outside the bakery where he was happy to sit about 6 inches above Levi's head. Yesterday I saw 3 boys of about 12 years of age gathered around a bird lying on its side with one of them apparently putting his foot on the bird's leg! I rushed over to save the bird but it turned out to be Mickey playing with his shoelaces! It was lovely seeing how fond of the bird these boys were.